From the start, the deck was stacked against “Fuego” and all the other songs from Halloween 2013. The stunt, which showcased once again the band’s willingness to constantly push themselves also had a bit of humor to it. Fans were expecting them to follow suit and cover someone else’s record, and instead they went into uncharted waters. This automatically put the “Wingsuit” songs on the defense. “Fuego” was clearly the frontrunner for jam vehicle of the album, so it had that cross to bear going into Summer Tour. Though the band did a decent job settling into the first non-holiday “Fuego” in Mansfield, the first true exploratory version came at SPAC, and hinted at the future orchestral beauty lying beneath the surface of the jam. This style of improv would continue in flashes over the course of the year and give new meaning to the term “Team Phish”. There was a sparseness and cohesion to their communication previously unseen even in the hallowed year of ’97 when Trey traded in his machinegun for a metronome. Here we see a focused and fluent Phish, listening harder and giving more to the conversation. 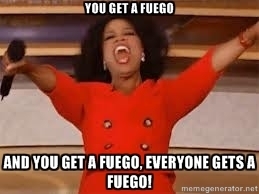 Mann “Fuego” was the jam of the summer. Period. There was immediate fear this would ruin the only song with an established jam from the new album, no one wanted that, no matter who you were. Those fears were put to rest at around the 9 min mark, right after Trey’s “outro” solo from the structure of the song. The band begins a gradual departure from the rock and roll chord progression with Page landing everything nicely on the rhodes and the band doing their best Grateful Dead impression, tinkering around with the new notes in a playful but not boring manner. After a few minutes of choosing a direction and Page switching over to piano, Trey, despite the haters resolve, takes the lead at 13:15 with a beautiful lick that would establish the next movement of this spontaneous piece. that lifted in intensity around the combination of Trey’s guitar, now with full distortion and soaring, and Page’s extremely confident grand piano work. The true beauty here came from Fish playing less like a rock drummer and more like an ensemble player with a full range of orchestral percussion. Though he played with sticks, the delicate nature of his playing felt more like mallet work and gave a silky and mature feeling to the stringed players meandering. A calypso-infused, “Cars, Trucks, and Busses”-esqe jam drops out of nowhere proving band was feeling it hard here in Philly. This added that ever-so-present humor vibe this band got famous for without sacrificing any of the mastery that came before it which is a very daunting task to say the least. This would end up being the last movement of a very unique piece of improv that was the first true sign of the new jam style of Phish which had taken them 6 years to ease into. It would still take them the rest of the summer to flesh out just how this newfound democracy would be effective enough to propel the energy of shows to the level that the fans were used to, but in doing so, created some of the most memorable jams of 3.0. Wade Ellis Wilby- Booking shaman and production curator at Blank Space. Wade still tours as a DJ/bandleader with stops this Summer at Camp Bisco and Catskill Chill.